Your site theme is what controls the look and feel of your site. This is what users see when they visit your blog. Every newly created blog has the same default theme, however you can choose from a large collection of themes to personalise your site. You can change your theme as often as you like! 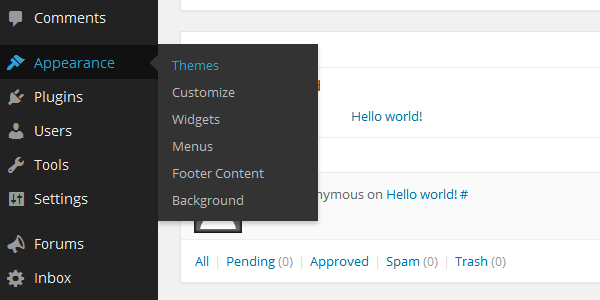 To change your theme, rollover the Appearance button in the menu on the left of your dashboard and select Themes. This takes you to the theme selection screen where you can view the collection of themes available. 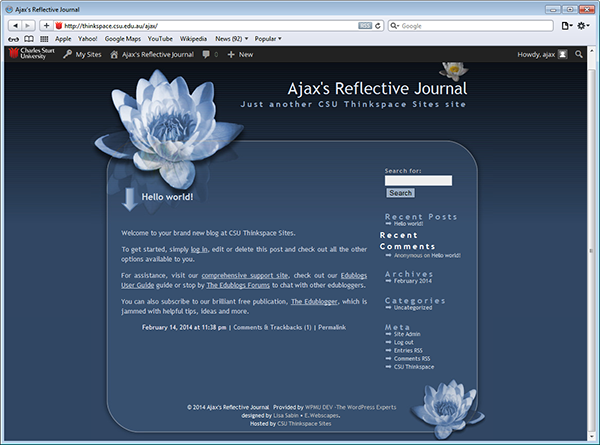 Click on a theme to view details. To preview your preferred theme click on the ‘Live Preview’ button. To activate your preferred theme click on the ‘Activate’ button. The Theme Customizer is designed to make it easier for you to customize your theme and see the results in real time without having to visit your blog. 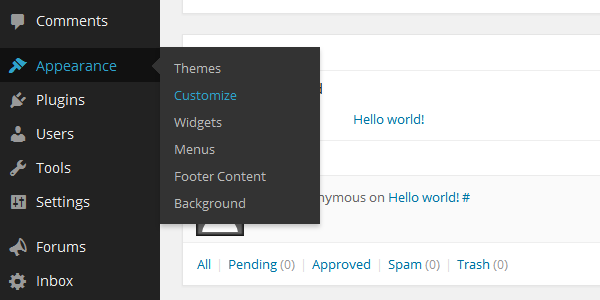 To use the Theme Customizer, rollover the Appearance button in the menu on the left of your dashboard and select Customize. 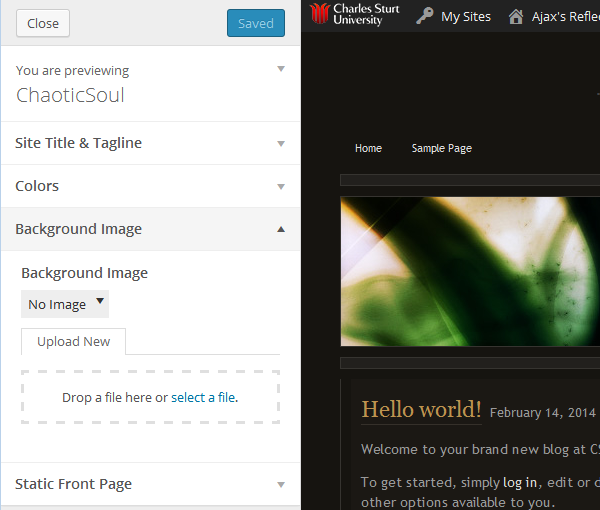 Use the control panels on the left to customize your site and preview your changes in real time before activating them. 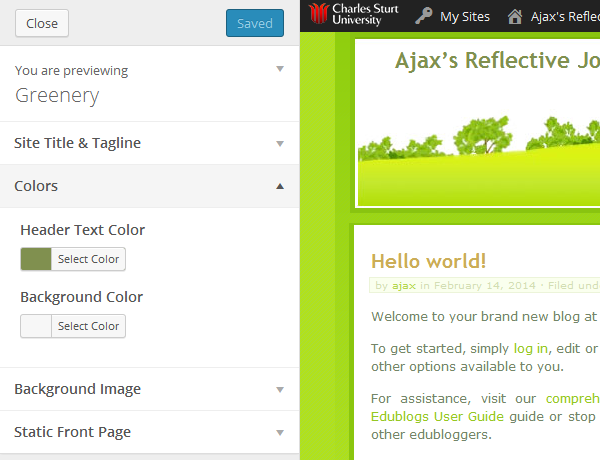 Themes like Edublogs Default, Anubis, Benevolence. 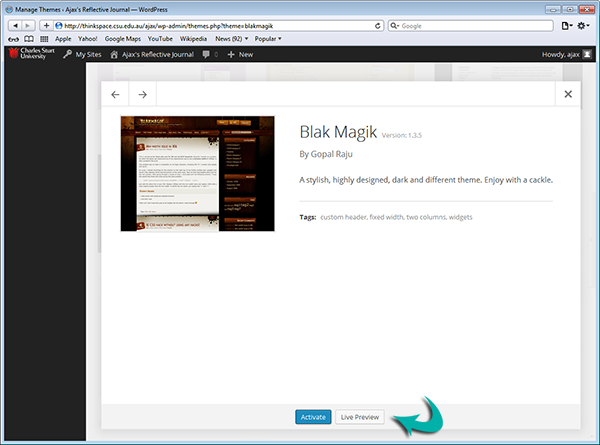 Blix, Connections and Contempt include an option to hide Header text. 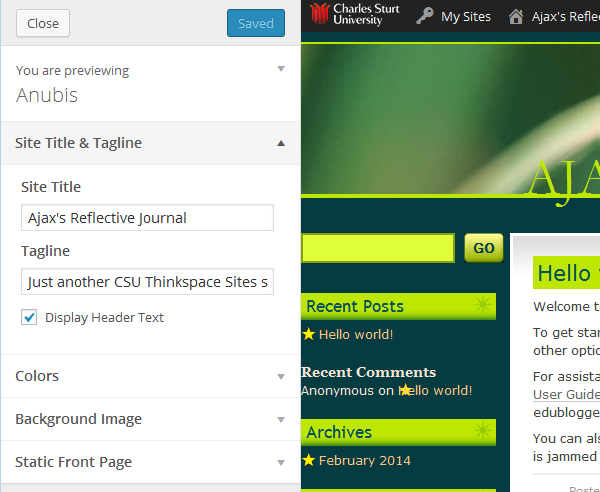 All you need to do is deselect the Display Header text option to hide the Site title and Tagline on these themes. 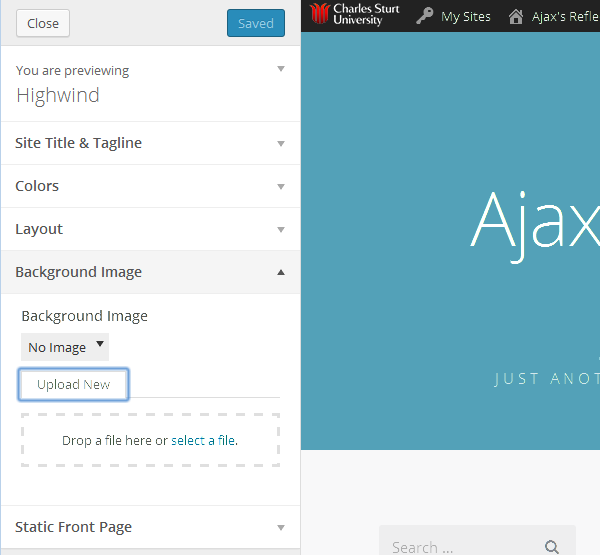 This option is used when you want to use a custom image header instead of text for the Site title. 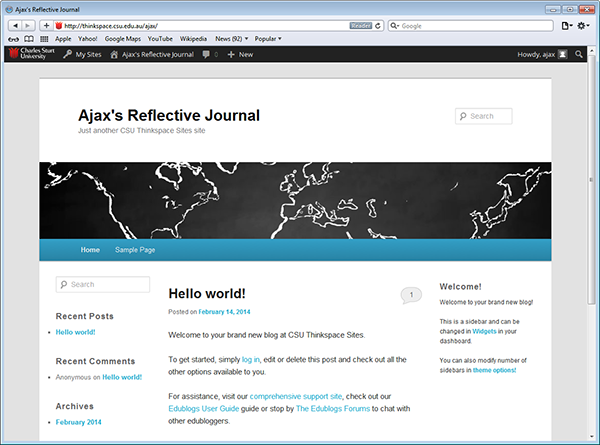 ‘Colors’ controls the color of the header text and background color. Which options are included depends on the theme. Not all themes allow you to change the header text color. Upload a custom header by selecting a file saved on your harddrive and uploading it. You can also upload your own custom image header using Appearance > Header (when using themes which permit custom headers). 1. Click on No Image. 2. 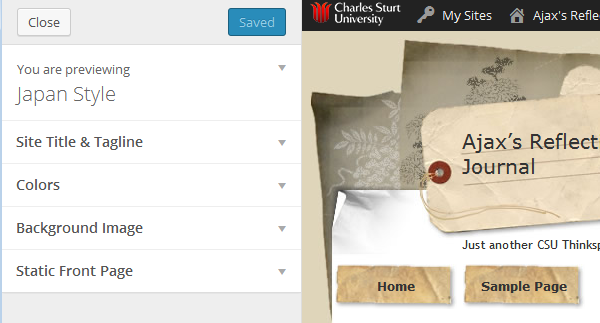 Click on ‘Select a file‘ (or drop file in upload area), select the background image you’ve saved on your computer and then click Open to upload. Please note: The background image is used as is. For best results resize your background to make it smaller if using an image from a digital camera (otherwise only the top part of the image will display). Most themes include a range of default backgrounds you can use. These aren’t supported by the theme customizer and you need enable a default background by going to Appearance > Preset Background once the theme has been activated. 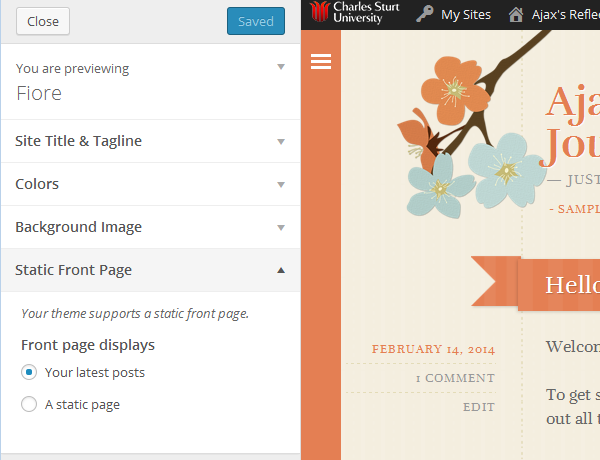 The static front page lets you select what appears on your blog’s home page. By default, your home page is your blog post page however you can change this so your homepage is a static front page and your posts are sent to a different page on your blog. To set a static front page click the Static Page radio button and select which pages you would like to use for your Front Page and your Posts Page. 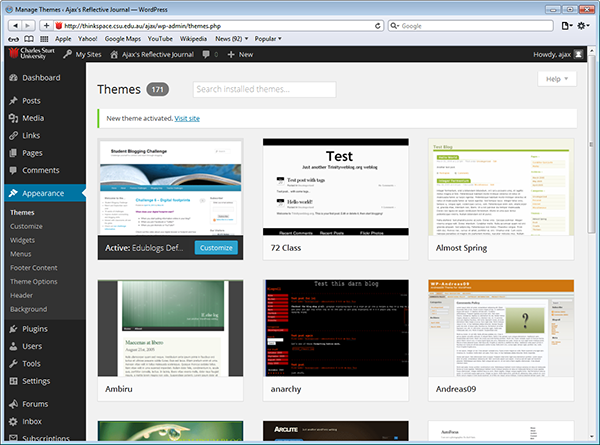 Some themes include additional options in the Theme Customizer. For example – layout, slideshow and Typography.